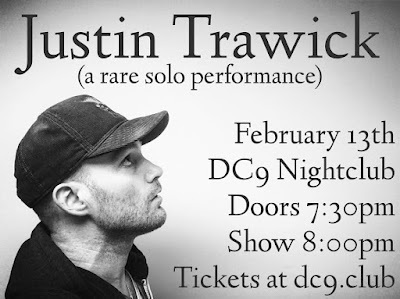 Local musician Justin Trawick is performing a show at the DC9 in Washington, DC on Wed Feb 13. Justin has been an extremely busy and prolific musician, touring with his own music, his band The Common Good and founding The 9 Songwriter Series. He also is co-founder of “The Circus Life Podcast" with guests such as Kevin Eubanks, Chris Thomas King, Ernie Halter, Yarn, and Snuffy Walden. This Wednesday will be a special night of music as Justin Trawick will be giving us a solo performance with Louisa Hall opening up the night for him. Music starts at 8pm. $12 in advance or at the door.